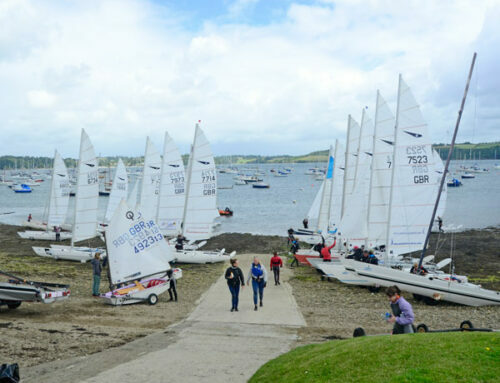 Six crews enjoyed amazing weather at the Windsports Centre over the weekend of 27th 28th September. The Crews had been drawn at random by after attending at least one UKIDA supported event. We are blessed with the perfect location for these coaching events although it was not all a hard slog. Windsport laid on a BBQ on the Friday night and a sociable Saturday evening in Castaways East just a short stroll away from our Centre in the Harbour. From our viewpoint at Windsport, we hope everyone in the coaching group got some valuable food for thought they can work with and add to their Dart racing tool box. We hope we left all those attending our sunny very light wind weekend with the understanding that: coaching is not about telling, but it is about drawing, expanding and evaluating, why, how and what we do when we are in Dart mode. If you would like to find out more about Windsport Coaching please contact us at 01326 376191.